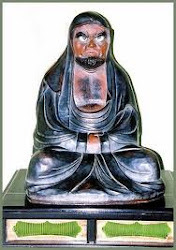 He was a warrior from South China, named Coxinga (Koxinga). Chinese military leader of the late Ming and early Qing dynasties. After the Ming dynasty fell to the Manchu, Zheng refused Manchu offers of rank and power and launched a military campaign against the new dynasty in 1659, taking a large force from his base in Fujian province up the Yangtze River (Chang Jiang). Initial success turned into failure, but, undaunted, Zheng took Taiwan from the Dutch in 1662 to use as a secure rear base area. Further glory was cut short by his death later that year. He became a popular deity and cultural hero to the Chinese on Taiwan, and even the Qing court honoured him as a paragon of loyalty. In Japan the playwright Chikamatsu Monzaemon celebrated him on the stage (Zheng had a Japanese mother), and in the 20th century both Chinese communists and Nationalists embraced him as a national hero. 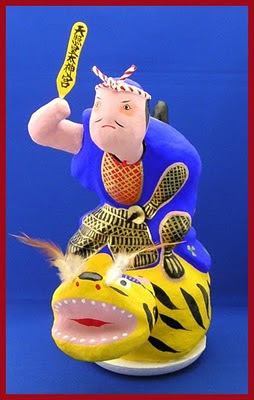 ... the famous warrior Watonai fearlessly grabbing a tiger by the tail. The surprised animal stops in its tracks, turning its head to see what is happening. A frightened retainer holding a gun over his shoulder reacts with shock, throwing his hand up in the air. Above, a one-legged boy encased in an umbrella waves his arms at the hero as a Buddhist deity holding a lotus blossom drifts by on a cloud. Koxinga attacking a huge tiger which carries one of his men with his spear; soldiers in the background force another tiger over a snowy cliff. is based on the true adventures of Coxinga/ Watonai, a warrior of Chinese and Japanese parentage, who fought for the restoration of the Ming Chinese government after its defeat in the 17th c. by Manchu invaders. In the kabuki play Watonai joined forces with Kinshojo, his Chinese step-sister, and Kanki, her husband. 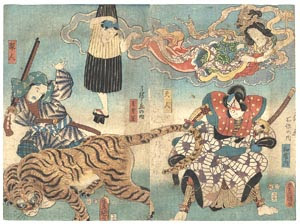 Chikanobu's print shows Ichikawa Sadanji I (1842-1904) playing the lead role, flanked by Bando Kakitsu I (1847-1893) in the female role and Nakamura Shikan IV (1830-1899) as Kanki. The colorful Chinese-style costumes, exotic settings in China, and dramatic "rough style"/ aragoto acting associated with Watonai made this a popular production. The role of Kinshojo was played by Bando Hikosaburo V (1832-1877) when he was at the peak of his career; Hikosaburo was the brother-in-law of Bando Kakitsu I, who evidently took over this onnagata part when Hikosaburo died unexpectedly. 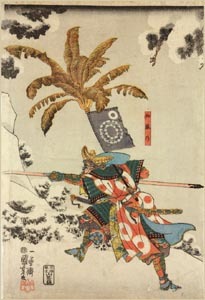 As in the Chikanobu triptych, Kunichika shows Nakamura Shikan IV in the role of Kanki. An on-stage rivalry between Shikan and Hikosaburo reportedly lead to shouting matches and fist-fights among their ardent supporters. Kunichika's depictions of Kinshojo and Kanki are joined with urban scenes signed "Hiroshige." These appear to be in the Yokohama-e style of Hiroshige III (1843-1894) and show the changes taking place in Tokyo. The street scene includes both traditional wooden shop buildings and new "fireproof" stores in the Western style, along with a rickshaw (a new form of transportation). The canal scene shows a lotus-filled moat in the Yotsuya area west of the old Edo Castle walls. He became famous in Japan since Chikamatsu Monzaemon wrote a Puppet Theater Play (bunraku) about him. 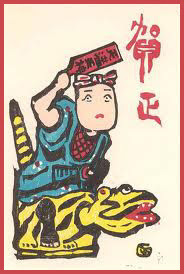 In the end, Watonai tamed the tiger and could ride it. 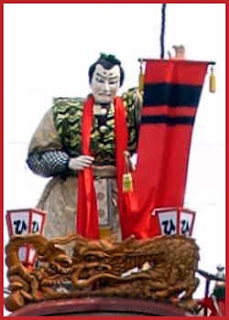 His face is painted with the kumadori make-up of Kabuki actors.
. Kato Kiyomasa 加藤清正 in Korea .
. Sadowara ningyoo 佐土原人形 dolls from Sadowara, Miyazaki .
. Reference in English . Coxinga (or Koxinga; Zheng Chenggong in Chinese) has been a highly politicized figure since his death. Based on one's cultural identification, political leaning, and nationality, people read him differently. In Interpreting Zheng Chenggong, Chong Wang, “examines the history of the dramatization of Zheng, by comparing selected texts from Japan, China, and Taiwan, written between 1700 and the 1960s, with regard to the historical contexts.” It’s a good read. In politics, Koxinga is an interesting figure because several opposing political forces have invoked him as a hero. For this reason, historical narratives regarding Koxinga frequently differ in explaining his motives and affiliation. Koxinga is considered a national hero in Mainland China because he drove the Dutch away from Taiwan and established ethnically Chinese rule over the island. Koxinga is considered a pirate in the Philippines because of his banditry and raids on Philippine soil. During the Japanese control of Taiwan, Koxinga was honored as a bridge between Taiwan and Japan for his maternal linkage to Japan. The Chinese Nationalist Party regarded Koxinga as a patriot who retreated to Taiwan and used it as a base to launch counterattacks against the Qing Dynasty of mainland China. As such, the Nationalists have frequently compared Koxinga to their leader Chiang Kai-shek. Supporters of Taiwan independence have held mixed feelings toward Koxinga. Recent Taiwanese independence supporters have presented him in a positive light, portraying him as a native Taiwanese hero seeking to keep Taiwan independent from a mainland Chinese government. 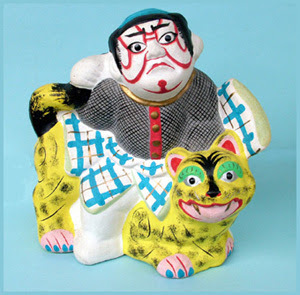 The Battles of Coxinga: Chikamatsu’s Puppet Play, Its Background and Importance. Keene’s lengthy introduction gives a solid description of Coxinga’s relationship to Japan and its culture. By the way, his Tiger Hero/Hunter image is completely unknown to most of the Chinese people. That’s a Japanese story.